For 77 years, the 198-foot Gothic spire of Notre Dame des Victoires Church dominated the St. Johnsbury skyline. Standing on Prospect Street, just around the corner from the Fairbanks Museum of Natural History, the church was a familiar landmark to most residents of "St. Jay" until it burned in 1966. 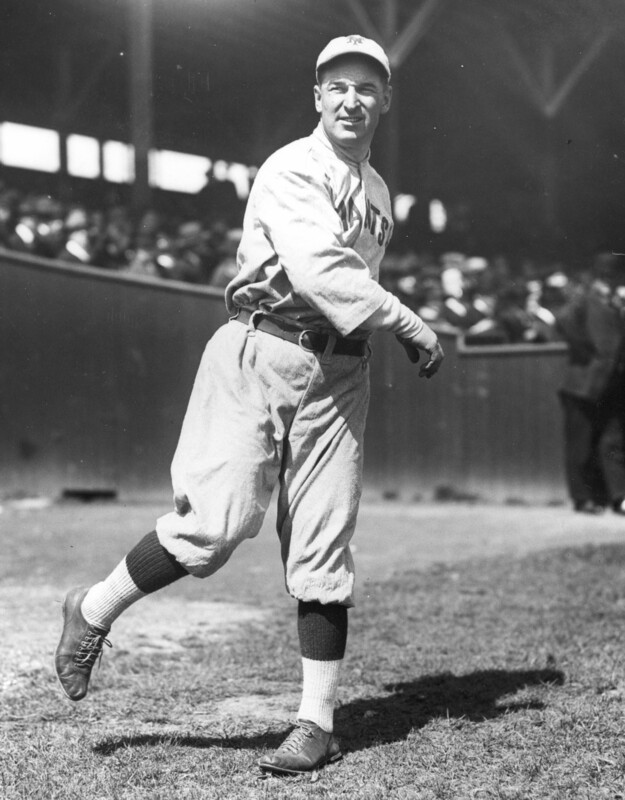 But probably no one knew that it was the reason that Jean Dubuc--a pitcher with an 85-76 lifetime record, 3.04 ERA, and a solid .230 batting average in nine major league seasons--was born in the chief city of Vermont's remote Northeast Kingdom. Before the turn of the century, the Dubuc family owned Granite Construction Company, an itinerant firm that specialized in building churches throughout the northeast. In the spring of 1887, Napoleon Dubuc relocated to Railroad Street in St. Johnsbury to start work on Notre Dame Church. That first summer, 150 carloads of Concord granite and thirty carloads of Isle la Motte stone were used to build the church's exterior. In the summer of 1888, the interior was finished in ash, frescoed, and lighted with stained-glass windows--St. Patrick on one side for the Irish parishioners and St. John the Baptist on the other for the French-Canadians. Later that summer--on September 15, 1888, to be exact--Napoleon and Mathilde Dubuc had a son (one of six she bore) whose given name at birth is variously reported as Jean Arthur, John Joseph, Jean Baptiste Arthur, and Jean Joseph Octave Arthur. As if those weren't enough, somewhere along the line he picked up the nickname "Chauncey." Despite his French-Canadian heritage, his first name was pronounced "Gene," at least in American baseball circles, while his last name was pronounced like Dubuque, the city in Iowa. When Jean was four, the Dubucs moved to Montpelier. The future major leaguer lived in Vermont's capital city for seven years before his parents sent him to the Seminary of St. Theresa in Montreal, where he studied for the priesthood There, the Rutland Herald reported, Jean "was undefeated in high school games pitched in Canada." As he entered adolescence, the family re-located yet again, this time to Fall River, Massachusetts, where Napoleon was the contractor in charge of building St. Ann's Church. Dubuc relative Bob O'Leary recalls a story from his childhood about how the 15-year-old Jean first learned to control his pitches in Fall River: "Behind home plate at the sandlot was the exterior wall of a drug store. Jean was throwing so hard and wild that the catcher could not always catch the ball. When it struck the outside of the pharmacy, all the items displayed on the inside of that wall fell to the ground and broke. Jean learned to control his great arm so that they could keep playing." Jean attended the prep program at the College of the Holy Cross in Worcester for one year, 1904-05, studying electrical engineering. He went out for varsity baseball, but on the second day of practice school authorities informed the 15-year-old that he was too young to play. For the 1905-06 school year, Dubuc enrolled at St. Michael's College in Winooski Park, Vermont. In only its second year of existence, St. Mike's already had a winning baseball team. Jean pitched every game that season, compiling a 13-4 record and recording double-digit strikeouts routinely. His exploits at the plate were even more impressive. Batting third in the order, he hit .528 with an .843 slugging average. To put that in perspective, subtracting Dubuc's contributions, the team's batting average falls from .300 to .271, and its slugging average plummets from .375 to .316. A century later, Dubuc, a three-sport athlete, was inducted into the college's Athletics Hall of Fame in September 2006. The following fall, Jean headed west to South Bend, Indiana, and enrolled at the University of Notre Dame. Though his first athletic participation on campus was as starting forward on the varsity basketball team, Dubuc showcased his true athletic brilliance on the baseball diamond. In the spring of 1907, the 18-year-old Vermonter posted a 5-1 record as the Fighting Irish amassed 21 victories against only two losses. Notre Dame was 20-1 the following season, with Jean upping his contribution to 9-1. Aside from Dubuc, the 1908 squad featured no less than four future major leaguers: second baseman George Cutshaw, who played regularly for 11 seasons with Brooklyn, Pittsburgh, and Detroit; first baseman Bert Daniels, who patrolled the outfield with the New York Highlanders for four seasons; catcher Ed McDonough, who backstopped for the Phillies for a couple of years; and pitcher Frank Scanlan, who had a cup of coffee with the Phils. Even in that fast company, Chauncey Dubuc glistened. His nine wins in 1908 stood as a school record until 1989, though later Notre Dame teams played much longer schedules. Of his 14 wins over two seasons, seven were shutouts, and even his two defeats were glorious. In 1907's only loss, Dubuc gave up just one hit and one walk while striking out 16--and getting three hits of his own. And his 1908 defeat was one of the most interesting games in the annals of Vermont baseball history. When Jean Dubuc pitched against UVM at Centennial Field during Notre Dame's 1908 eastern trip, Vermont baseball enjoyed a banner day. The game featured three of history's most distinguished Green Mountain Boys of Summer: Dubuc on the mound for the visitors, Ray Collins for the home nine, and Larry Gardner at shortstop. In a hard-fought game in which Collins struck out 13, UVM handed the Fighting Irish -- and Dubuc -- their only loss of the season, 6-3. "[Notre Dame], the much heralded champions of the Middle West, came to Burlington with a series of 12 victories," bragged UVM's yearbook, The Ariel, "yet even with the far famed Dubuc in the box, they were unable to keep us from scoring six runs." Jean Dubuc intended to return to Notre Dame in the fall of 1908 but was forced to change plans when a semipro game in Chicago cost him his amateur status. Adopting the alias of "Williams," Dubuc pitched a lackluster team called the White Rocks to a 2-1 victory over the powerful Gunthers, but the ruse was detected and reported in the Chicago Tribune. Without hesitation, Notre Dame authorities ruled their best pitcher ineligible for further collegiate competition. Jean barely had time to peel off his White Rocks uniform before receiving offers from seven major league teams. He signed with the Cincinnati Reds, with whom the 19-year-old made his major league debut on June 25, 1908. In his first big league game, he was pulled in the fourth inning after severely wrenching his knee, an injury that plagued him for the rest of his career. He pitched only once more until September, when he returned to action as a regular starter. Dubuc ended up 5-6 with a solid 2.74 ERA. One of his victories was a two-hit shutout over the world-champion Chicago Cubs. That fall, Jean won three of his four decisions on Cincinnati's barnstorming tour of Cuba. It looked like 1909 might be a big year for the young Vermonter. But in spring training he contracted malaria, causing him to miss most of the season and reportedly still affecting his play badly the following year. In 1910, Reds manager Clark Griffith sent Dubuc to Buffalo of the Eastern League, but when the pitcher continued to struggle (his record was 0-6), Buffalo released him. Jean went home to Montreal, where his father had moved after Jean's mother's death. For the French-speaking Dubuc, Montreal was the perfect place to turn around his sagging baseball fortunes. Jean joined the Royals, the local Eastern League club, and rebounded to 21-11 in 1911, thanks mainly to an effective change-up reportedly learned from his catcher, major league veteran Frank Roth. Jean was no slouch at the plate, either. The Dubuc scrapbooks reveal that in 26 pinch-hit at-bats in Montreal, Jean had an astounding 22 hits. Dubuc also opened a successful business, The Palace Bowling Alley and Pool Room at 282 St. Catherine Street, and bought stock in the Montreal Wanderers, one of two local National Hockey Association franchises. Of course, with 21 wins to his credit, Dubuc was eagerly wanted back in the majors--it was said that 15 big league scouts were in the stands for one of his starts. Montreal's asking price was reportedly $10,000 and a couple of players, but in September the Royals accidentally exposed him to the major league draft. Ten of the 16 clubs put in claims, with the Detroit Tigers finally obtaining him for the bargain price of $1,500. Detroit offered Dubuc a salary of $2,250 for 1912. Sitting pretty in Montreal, Jean played coy. In a letter to Tigers owner Frank Navin, he pointed out that $2,250 for seven months' work contrasted poorly with his 1911 salary of $2,196.68 for five months, not to mention the need to hire a manager to run his business if he left Montreal. Dubuc countered with two options: Navin could raise him to $2,800 or allow him to buy out his own contract for $1,500. While that response may seem brazen for an unproven youngster, Dubuc's letter, preserved to this day in his file at the National Baseball Library, is a model of courtesy. Somehow the differences were resolved, and in 1912 Jean Dubuc began a five-year stint in Detroit (rooming with Ty Cobb on road trips) with a spectacular first season, beginning with a win in the first game ever played at Tiger (Navin/Briggs) Stadium. Though overshadowed by Walter Johnson's and Smoky Joe Wood's record 16-game winning streaks, Dubuc compiled an 11-game streak of his own en route to a 17-10 record, with two shutouts and an ERA of 2.77. In a feature article in Baseball Magazine, F. C. Lane called Dubuc "The Slow Ball Wizard." Lane wrote that it was Roth who taught him the slow ball in Montreal in 1911, though others claim that Clark Griffith had shown it to him two years earlier. Another sportswriter dubbed him the "best pitching find of the season." Hall of Fame umpire Billy Evans pronounced his change-up the best in the American League. Over the next four seasons, amid repeated salary wrangles, Dubuc showed flashes of his original glitter but never put together an entire season of distinction. In 1914, for example, he started off in a blaze, winning his first five decisions -- despite hurting his knee again on April 15 - and bringing forth headlines like "Looks Better Than Ever." According to one newspaper, "Some of the diamond critics believe that he is destined to become the best pitcher in baseball." But for the rest of that year his won-lost record was only 8-l4, his ERA for the season escalating to 3.46. He came back in 1915 with a 17-12 record, including a career-high five shutouts (one of them a one-hit, 1-0 triumph over the great Walter Johnson). But when his knee injury resurfaced in 1916, causing him to tail off to 10-10, the Tigers figured he wasn't worth a big salary and sold him to Chattanooga. Dubuc went 22-16 games for the Salt Lake City Bees in the Pacific Coast League in 1917, playing outfield often and pinch-hitting with some frequency. He suffered a serious automobile accident in late March 1918 but again pitched well for Salt Lake that season. In July he was one of 10 Bees ordered to show cause why they should not be designated 1-A in the draft. Dubuc told the Salt Lake papers that he wanted to join the war effort as a French interpreter, but when he was granted a deferment due to his bad knee, his appeal increased to major league teams seeking to restore depleted rosters. The Boston Red Sox purchased his contract and on July 25 he reported to the Red Sox on the road at Comiskey Park. With the Red Sox Dubuc appeared in five games, but pitched in only two. The first was his debut on July 28; he allowed one run, throwing the last two innings of an 8-0 loss to Chicago, and was 1-for-1 with a single in his only at-bat. His second appearance was his only start, the second game of a double header in New York, which he lost in the bottom of the ninth, 4-3. Dubuc was 1-for-6 at the plate during the regular season. His only appearance in the World Series came when Barrow wanted a right-handed pinch hitter in the ninth inning of Game Two. The Red Sox were down 3-1 with men on first and third and one out. Dubuc struck out, then Schang popped up to end the game. John McGraw's New York Giants acquired Dubuc before the 1919 season. In an era when relief specialists were unheard of--Firpo Marberry, often credited for launching that role, didn't appear until five seasons later--Dubuc pitched in 36 games, only five of them starts, leading the N.L. with 31 relief appearances. He won six, lost four, saved three (tied for second in the league in that category), and led the league in games finished (22), an early example of the "closer" in baseball. Dubuc compiled a 2.66 ERA and allowed only 119 hits in 132 innings as the Giants finished in second place.. He seemed to have found a niche. Based on his stellar 1919 performance, Jean Dubuc appeared to have earned another shot at the majors. "He doubtless will festoon the Giant staff for some time to come," was how one writer put it. But after the fall barnstorming tour, McGraw unexpectedly released Dubuc. The 31-year-old veteran hooked on with the Toledo Mud Hens, for whom he played all positions except catcher and middle infield in 1920. In the American Association, Dubuc proved his value by winning nine games on the mound with a 2.72 ERA, batting .292, serving as field captain, and even replacing Roger Bresnahan as manager at midseason. Why did the sage McGraw exile Dubuc to Toledo, and why did he never again pitch in the major leagues? The answers to those questions became apparent only as the details of the Black Sox scandal unfolded. On September 24, 1920, pitcher Rube Benton, a former teammate of Dubuc's with the Giants, testified before a grand jury in Chicago that he'd seen a telegram disclosing that the Series was fixed. "I don't know who sent it," Benton said, "but it came to Jean Dubuc, who was barnstorming with us. It simply said: 'Bet on the Cincinnati team today.' I suppose it came from Bill Burns, who had been close to Dubuc a few weeks before the Series when both were living at the Ansonia Hotel in New York City." Benton didn't mention another possible source: Chick Gandil, with whom Dubuc had been good friends since they played together in 1911. Having his name come up in the baseball bribery investigation wasn't a positive development for Dubuc, to say the least. In the aftermath of Benton's testimony, The Sporting News published a piece in its issue of November 11, 1920, entitled "Why Dubuc Was Dropped." The article quoted McGraw as saying that he released Dubuc because he "constantly associated" with Burns, a gambler who'd played with Jean on the 1912 Tigers. According to The Sporting News, McGraw suspected that Burns and Hal Chase, who'd also been mentioned in the Chicago hearings, might have caused the Giants to lose out to the Reds in the 1919 pennant race. While Commissioner Landis was handing out banishments from baseball, Dubuc wisely made himself unobtrusive by leaving the country for the entire 1921 season. Others who were no more implicated in the scandal than Dubuc were banned for life, but Landis failed to notice the newly obscure pitcher in Montreal's Atwater Park Twilight League. By 1922, Jean was back in the United States, pitching in the minors for the Syracuse Stars. The Sporting News lifted an offended eyebrow: "The astounding news comes from Syracuse that President Ernest Landgraf plans to take on Jean Dubuc, former major leaguer and later with Toledo, from which club he drew his walking papers because he was supposed to know too much about the throwing of the 1919 World's Series." Still Landis looked the other way, and Dubuc was allowed to carve out a modest living in the minors for the-next several years. Dubuc played for Syracuse again in 1923, and was a player-manager for both Ottawa and Hull in 1924. He played for Manchester in 1926 and Nashua in 1929, where his brother Arthur owned the team. In 1927 Jean moved to Providence, Rhode Island, where he coached the Brown University baseball and hockey teams and founded the Rhode Island Reds of the American Hockey League. While in Rhode Island he scouted for the Detroit Tigers, signing Josh Billings, Gene Desautels, Birdie Tebbetts, and the great Hank Greenberg among others. New York Yankees scout Paul Krichell recalled spending the better part of a year visiting the Greenberg family and manfully eating Yiddish food, only to watch with dismay as "in stepped Jean Dubuc... who called at the Greenberg house, bringing along his own ham sandwich, and signed up Hank right under the very shadow of Yankee Stadium." In 1936 Dubuc returned to his native state as manager of the Northern League's Burlington Cardinals, but the following year he left sports altogether. For the next two decades he worked as a printer's ink salesman for the Braden-Sutphin Ink Co., eventually retiring to Florida. His wife, Lu, died in 1956. The couple had no children. Bob O'Leary's grandmother cared for her uncle Jean after a stroke robbed him of mobility and speech; she reported that for the last months of his life, the only word he could say was "merde." Following a three-year illness, Jean Dubuc passed away in Fort Myers on August 28, 1958. "He was a very dear friend of mine up to the time of his death, was a very fine baseball man, an excellent baseball instructor, and a fine gentleman," said Birdie Tebbetts. Lane. F. C. "Slow Ball Wizard"
Thanks for research assistance by Cappy Gagnon and Bob O'Leary.